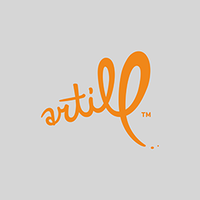 The young foundry artill is based in south-west Germany, run by Lukas Bischoff. Besides his love of typography he works as a Freelancing Art Director and Illustrator. His foundry made its MyFonts debut in March of 2009 with the font Sketch Block. Since 2012 the foundry collaborates with other designers to enhance the optical and technical quality of every font.